It has since been edited, but on page 12 of Target Australia's recently released Easter Catalogue, Rockstar's open world western was listed for PS4, Xbox One, and Nintendo Switch, though - in reality - the game is currently only available for the first two platforms. See for yourself in the screenshot below, taken before Target discovered its mistake. It's very possible that this was just a simple human error that the retailer has now amended, or it's covering its tracks for a Red Dead Redemption 2 port that no one thought was even possible, given the horsepower which Rockstar's latest runs on. 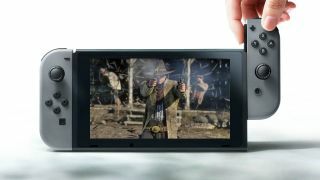 Interestingly enough, however, Nintendo has previously stated that it would "love" to have Red Dead Redemption 2 on the Switch, and only reason it's currently not there is down to timing (the console was announced years after development began on the game), and not technicalities. Has Rockstar taken notice of Nintendo's comments since then, and got in touch to work on a potential port? It seems dubious, but this faux pas on Target's part certainly lays the groundwork for a potential reveal in the near future. Again, is it unlikely? Absolutely. Does that mean its in impossible? The ball's in your court, Rockstar. Red Dead Redemption 2 is easily one of the best RPG games that you can play right now. Find out which other titles are up there, or watch our review below to find out why.